The world of Gods and Goddesses has always been a there to set examples and guide the lost souls of earth, but myths and legends are not always able to elucidate the purpose they have been present in the religious scriptures. One such story might be the mysterious coupling of Lord Shiva and Lord Vishnu as Mohini creating Lord Ayyappan - the deity of fertility as a consequence of this divine act. Nevertheless, the faith of devotees in the works of Gods has always remained intact. The proof stands in the form of Sabarimala, a Hindu pilgrimage place associated with Lord Ayyappan which has only become more popular. Its location in Western Ghats of Pathanamthitta district has only augmented its tourism value, as is perpetually professed by its state Kerala, rightly tagged as 'God's Own Country. The Ayyappan Temple for which Sabarimala is so well known is surrounded by 18 hills, all having several temples on them. Another interesting facet of the worship in the temple is the prohibition of women in the menstrual age-group of 10-50 years as the Lord was a celibate. This leaves with males predominantly worshipping in the temple - clad especially in either blue or black, unshaven and with sandal paste on forehead. The dates on which one can be a part of temple rituals are also scant in comparison to most of the other temples in India. These includes days of Mandala Pooja, Makara Vilakku, Vishu and first six days of Malayalam Calendar. Dates may vary every year as per the ritualistic calendar. 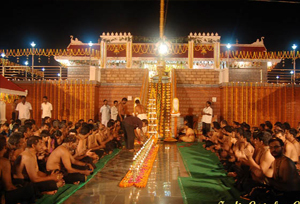 The pilgrimage is one of the toughest with the distance of 52 Km through the Aludha River, Aludha Mountains, Karivalam Thodu, Karimala crossing, Cheriyanavattom, Valliyanavattom, Pamba River, Neelimala, Ganesh Bettam, Shreeram Betta Padam with a halt at Aranmula kottaram during 'thiruvabharana khosa yatra'. Then a four kilometer trek in forest is all what is needed to be covered to reach Lord Ayyappan's abode. As legends would have it, Lord Ayyappan is believed to have taken the route from Erumely to Sabarimala; the distance is 52 Km approximately and in present days millions of pilgrims take the route in atonement of their sins and in expectation of completion of their wishes. There have been stories of Lord Ayyappan killing a demon Mahisha in this very place where the temple could be seen today. The temple was found lost to the world for the difficulty one faces in reaching to the temple. However, King Rajasekara Pandian is credited for being able to make locate the route to temple once again after which the pilgrimage started again and later took the shape one seen in today's time. The king found the Lord with a 'mani' around his neck, hence the name 'Manikandan'. The Lord is identified with other names as well. Main of them includes 'Hariharasuta', a combination of 'Hari' (Lord Vishnu), 'Hara' (Lord Shiva) and 'Suta' (meaning 'son') translating to 'Son of Lord Vishnu and Lord Shiva. There are several stories that back the presence of a Son of two male Gods. One tells about Mahishi, sister of Mahishasura (a demon killed by Goddess Durga) asking for a boon from Lord Brahma to be immortal but since that couldn't possibly be done, she asked for vulnerability only by the son of Lord Shiva and Lord Vishnu, two male Gods. Later when she stated venting out her anger for the killing of her brother, Vishnu took form of 'Mohini' to create a child with Lord Vishnu that could stop Mahishi. Another story tells about Brahma sutra trying to destroy Lord Shiva himself by gaining the boon of destroying anyone or anything he places his hands upon by the Lord himself. This is when Lord Vishnu became the enchantress 'Mohini' and bewitched the demon to the extent of getting him to place his hands over his head destroying him in moments and saving Lord Shiva in the process. When Lord Shiva came to know of the events, and wanted to see Lord Vishnu as the enchantress in curiosity which changed into passion the moment 'Mohini' appeared in place of Lord Vishnu, leading to appearance of Dharma Shastha (Lord Ayyappan is an incarnation of him) as a result of Divine Coupling. The mythologies thus give the reason behind why followers of Shakti, Shiva and Vishnu find taking the pilgrimage. Ayyappan Temple: The main part of the temple is reached after covering 18 steps each representing an important aspect of human being; 5 senses, 8 emotions, 3 qualities, knowledge and ignorance that make human what they are. The pilgrimage on the day of Makara Vilakku (Makar Sankranti) - 14 Jan is among the most popular one, when a jewel casket is used to adorn the Deity of the temple. Malikapurathamma Temple: Dedicated to Devi Malikapurathamma, the temple is about mythical relationship of the devi and Lord Ayyappan. Offering prayer to this temple as well to the one nearby - the Kaduthaswamy is natural for a pilgrim to Sabarimala. By Train: Chengannur and Kottayam are connected with railway with other south Indian cities. People coming from other places can come here to travel further to Sabarimala some 82 and 120 Km, respectively by direct bus services to Pathanamthitta and Pamba. By Road: Regular buses from major towns like Thiruvananthapuram, Ernakulam and Pathanamthitta are operated. Special days call for more services which is taken care by KSRTC.